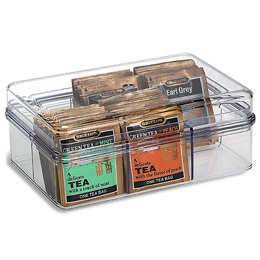 Rachel B. cooks...: Kitchen organization: Tea Bags... everywhere! I have been getting the organization bug for a while now. I used to see features on home websites, magazines, and pinterest about organization and pass them over, thinking in my head "boooorrring." But now, I have been reading blogs like I heart organizing and dreaming of home without clutter. What would my mother say? I was the kid that never cleaned my room growing up (imagine messy beyond belief - can't see the floor kind of thing) with adamant stubbornness. I'm definitely neater and more house-hygiene-conscious than I was as a kid, but since spring started, I've been trying to turn over a new cleaning/organization leaf. Recently, I had this epiphany - Why do my boxes of tea bags need to be all over the place? I mean, I literally have tea bags in three different spots in my kitchen because I have no organization system for them. Most are shoved in the bottom of a cabinet piled on top of each other. Three others are on my counter. Then, I have a white ceramic canister full of other miscellaneous teas. Who knows how many varieties of tea are actually in my kitchen, but I really would like them to be in one central location, neatly and efficiently arranged. This product had great reviews at The Container Store. This tea bag organizer says it can fit up to 72 tea bags - however, one reviewer states she fit 92! At $12.99, this seems like a great solution, and at only 8.5 inches deep, it would easily fit in most cabinets/shelves in your kitchen. In fact, there's a video from a professional organizer on how to make these containers fit up to 90 tea bags (I don't think you need the whole 4 minutes to explain that you just alternate the tea bags right side-up and upside-down to squeeze more in, but God love her - she loves talking organization). 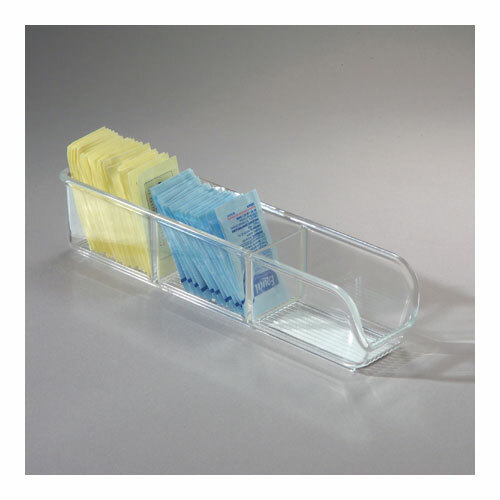 You can also try this tea bag & sugar packet (below, left) organizer from OrganizeIt.com for $4.99. 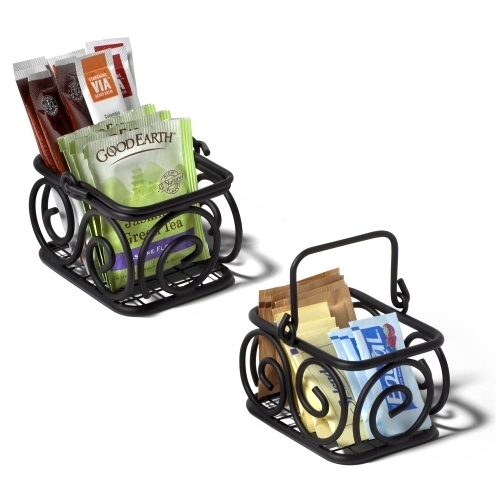 Or, if you have an even smaller space available and a not-so-big tea collection, you can use these small wire baskets (above, right) from the same website for $4.99. You can also go for something more decorative than clear plastic/acrylic containers and opt for this bamboo box from OrganizeIt.com for $21.99. It doesn't specify how many tea bags you can fit in this box, but since there's 8 compartments I'm guessing you could fit at least 10 in each, giving you space for 80 tea bags. Maybe more! It's 7.25 inches deep so it would fit nicely on most open shelving or inside any cabinet. I'll be sure to update again when I decide which route to go. I think I'm torn between the clear container from the container store and the bamboo box from OrganizeIt.com. So what do you think? 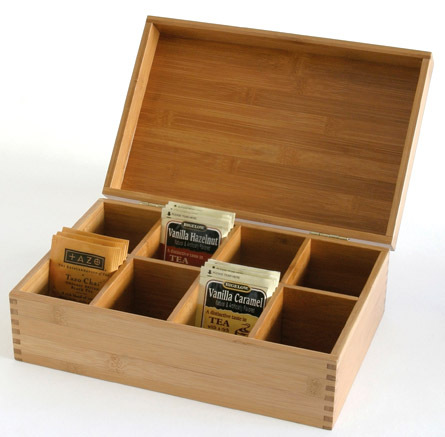 What have you done to get your tea bags organized? What are your favorite organization blogs?